CPR mannequins creep me out. That one is me holding the adult face in front of my own. 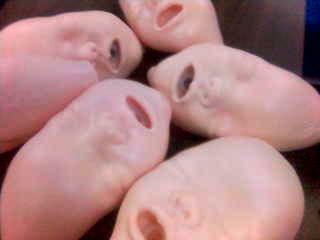 These things look like something you'd see in a horror movie. Spooky. 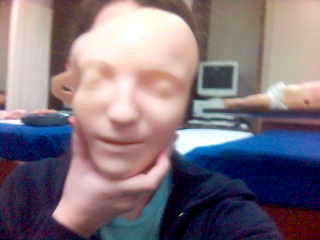 As a health care professional, it makes sense for me to learn basic life support. I've earned a card from the Red Cross in the past, but the school requires our training come from the American Heart Association. There are minor differences between the two programs, but they still amount to the same thing: several hours of watching videos and pumping the chests of armless, legless dolls. I think my favorite part of the entire certification process was the AED machine. AED's weren't part of the program the last time I did CPR training, but I'm glad they've come into common use. The thing is essentially a talking, idiot-proof ECG + defibrillator that calculates when and how hard to shock a person in cardiac arrest. Technology is a beautiful thing. I won't have to renew my certification for another year now, which is good because no one likes an early Saturday class. To reward myself for a hard week of work, I went to Coldstone for some icecream. I was pretty disappointed that blueberry is no longer the flavor of the month, but chocolate mint served me just as well. Only one test and two practicums to study for next week. It'll be nice to have the break. One word about those faces. CREEPY!!!! It's a good post, for sure, but make sure you are prepared for anything by checking out heart defibrillator . The The Philips Heartstart Defibrillator could save your life.